Note: Greig's Thread has been moved to here. This week WUWT's Serengeti Strategy is aimed fairly and squarely at Kevin Trenberth. (Archived here.) Anthony Watts targeted Dr Trenberth earlier this week in his recent article about ENSO and the PDO and the impact on global surface temperatures. Now he's decided to have a shot at him over the Earth's energy budget. I don't imagine Anthony or his followers have much of a clue about how the energy budget is calculated. Anthony posted a link to the Trenberth, Fasullo and Kiehl (2009) paper on the subject, but I imagine his eyes glazed over when they got to the first paragraph. That's if he even started to read it. I know my mind went a bit fuzzy trying to work through and remember all the different sources of data and the corrections and adjustments that were made. In his article, Anthony discusses the differences over time between versions of the Earth's energy budget. He compares a poster on the NASA website with the budget in the 2007 AR4 IPCC report and Trenberth09. The AR4 diagram was from Kiehl and Trenberth 2007. Note that in Trenberth’s 2009 paper, the energy from “back radiation” (from GHG action) value went up from 324 w/square meter cited by the IPCC in 2007 to 333 w/square meter. The net effect of that is increased energy back to Earth’s surface, making it warmer. It seems odd that would increase so much, so quickly in two years. Even more surprising, is that now, the value has been revised even higher, to 340.3 w/square meter, while at the same time, the “Net Absorbed” value, that extra bit of energy that we get to keep from the sun on Earth, thanks to increased GHG action, has gone DOWN. Perhaps the recent published works on climate sensitivity, coupled with observations of “the pause” have had some affect on these numbers as well. I'd say he's got that backwards. Observations would help inform estimates of climate sensitivity not the other way around. He got one thing right, though. Scientists will undoubtedly continue to work on refining estimates of the different components of the energy budget. Incoming solar TOA 340 W/m2. Solar reflected at the top of atmosphere 100 W/m2. Thermal up at the surface 398 W/m2. Net absorbed at the surface 0.6 W/m2. When the numbers are summed, the NASA poster has a 0.6 W/m2. difference at the top of atmosphere and a 0.6 W/m2. net absorbed at the surface. The IPCC diagram has ranges and uses whole numbers so it sums to 1 W/m2 difference at the top of atmosphere. At the bottom of the IPCC chart it shows 0.6 W/m2. net absorbed at the surface. The energy numbers at the top of atmosphere are the same for both, allowing for rounding. The main difference between the charts is how energy is apportioned. That is, the apportioning of the energy absorbed and reflected within in the atmosphere vs that absorbed and reflected at the surface. Yet the differences are not that great. Like all fake sceptics, Anthony doesn't know what is meant by "settled science". Most particularly not when it comes to climate science but I don't expect he would understand it when it comes to any branch of science. And like all disinformers, Anthony pretends that if science changes it means that either "all the science is wrong" or the "science is a hoax" or scientists are just making stuff up. You'd think he'd have figured out by now that the reason people do research is to refine and add to knowledge. And there will always be new things to learn. The "more settled science" is the energy flux at the top of atmosphere. The satellites do a good job of monitoring this. The "unsettled science" is how energy is apportioned within the atmosphere and between the atmosphere and the surface. Not only is it difficult to get measurements and use them to calculate the various parts, but I would expect values would vary over time. Not just on a minute by minute, hour by hour, season by season basis. It will undoubtedly change as the climate changes - there may be more or less clouds in the future. Different types of clouds may predominate in future climates. Vegetation patterns change over time. Ice is certainly melting. And so on. Where do the measurements come from? In the present study, we do not only rely on satellite observations, but make extensive use of the information contained in radiation measurements taken from the Earth surface, to provide direct observational constraints also for the surface ﬂuxes. Such observations become increasingly available from ground-based radiation networks. We use these observations to assess the radiation budgets as simulated in the latest modeling efforts performed within the Coupled Model Intercomparison Project Phase 5 (CMIP5) for the upcoming 5th IPCC assessment report (IPCC-AR5) (Sects. 3, 4). We further combine the surface observations with these models to infer best estimates of the global mean surface radiative components (Sect. 4). Anthony and his deniers wouldn't like that much, combining surface observations with models to infer best estimates. Many of them would prefer their models to come in glossy magazines or perhaps matchboxes (surprisingly, these still exist). One of the important constraints commonly used is ocean heat content, for example. Another thing worth noting is that CERES doesn't have a thermal channel (outgoing longwave radiation). Wild12 states that at the top of atmosphere, "thermal daytime radiances are determined from the difference between the total and solar channel radiances". There is a lot of detailed explanation in all the papers of just how the energy budget is put together. It makes for heavy reading, but it's not hard to follow if you take the time and concentrate. The main difficulty I had, not being familiar with the subject, was keeping track of all the components and data sources. There is a lot of jargon to learn, but the acronyms and terms are well explained in each of the papers. In regard to working out the details of the energy budget, here are some quotes just from the three papers I've referred to here. The first quote is from Kiehl and Trenberth (2007), to show that people have been considering this matter for some time - like almost a hundred years. Also where the biggest hurdles lay at the time. There is a long history of attempts to construct a global annual mean surface–atmosphere energy budget for the earth. The first such budget was provided by Dines (1917). Over the years improvements in estimating the global annual mean energy budget have resulted from satellite observations. In particular, the narrowed uncertainty in the planetary albedo and outgoing longwave radiation (e.g., Hunt et al. 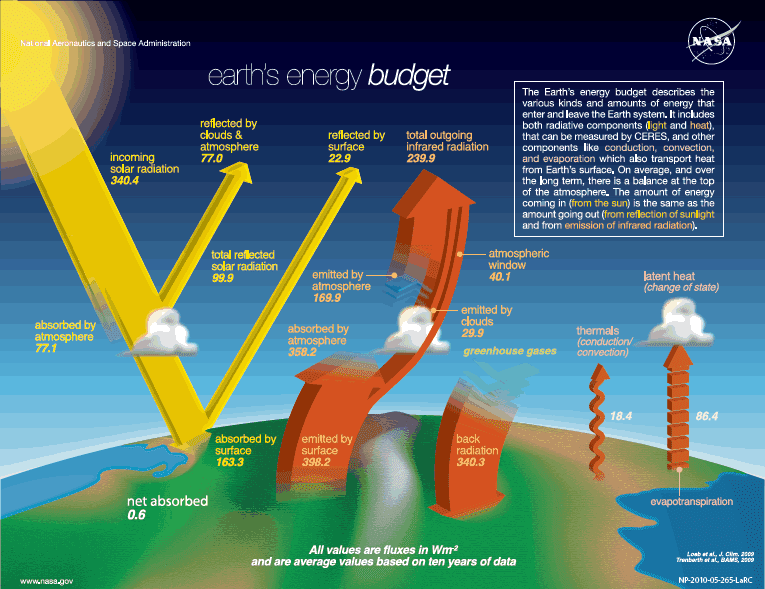 1986) have greatly improved our understanding of the earth’s energy budget. Recently, global satellite-derived estimates of precipitation have also aided (through conservation of moisture) in determining the annual global mean surface latent heat flux. Despite these important improvements in our understanding, a number of key terms in the energy budget remain uncertain, in particular, the net absorbed shortwave and longwave surface fluxes. This next one is from Trenberth, Fasullo and Kiehl (2009). I chose this particular passage because it gives a glimpse of the complexities. There are a lot of things to account for when working out the energy budget in the detail. That's why so many different sources of data are required - including data from satellites and measurements taken at the surface. (My paras). Weather and climate on Earth are determined by the amount and distribution of incoming radiation from the sun. For an equilibrium climate, OLR [outgoing longwave radiation] necessarily balances the incoming ASR [absorbed solar radiation], although there is a great deal of fascinating atmosphere, ocean, and land phenomena that couple the two. Incoming radiant energy may be scattered and reflected by clouds and aerosols or absorbed in the atmosphere. The transmitted radiation is then either absorbed or reflected at the Earth’s surface. Radiant solar or shortwave energy is transformed into sensible heat, latent energy (involving different water states), potential energy, and kinetic energy before being emitted as longwave radiant energy. Energy may be stored for some time, transported in various forms, and converted among the different types, giving rise to a rich variety of weather or turbulent phenomena in the atmosphere and ocean. Moreover, the energy balance can be upset in various ways, changing the climate and associated weather. Despite the central role of the global energy balance in the climate system, substantial uncertainties exist in the quantification of its different components, and its representation in climate models, as pointed out in numerous studies published over the past decades (e.g., Hartmann and Short 1980; Hartmann et al. 1986; Ramanathan et al. 1989; Gutowski et al. 1991; Ohmura and Gilgen 1993; Pinker et al. 1995; Li et al. 1997; Gleckler and Weare 1997; Kiehl and Trenberth 1997; Wild et al. 1998; Gupta et al. 1999; Hatzianastassiou and Vardavas 1999; Potter and Cess 2004; Raschke and Ohmura 2005; Trenberth et al. 2009; Trager-Chatterjee et al. 2010; Ohmura 2012; Qian et al. 2012; Wild 2012; Stephens et al. 2012a, b). This becomes also evident when comparing different schematic diagrams of the global energy balance published in text books or in the peer-reviewed literature, which often vary greatly in the numbers given therein representing the magnitudes of these energy flows in terms of global means (e.g., Kiehl and Trenberth 1997; Trenberth et al. 2009; Wild et al. 1998; Raschke and Ohmura 2005; Wild 2012; Stephens et al. 2012b). Note that somehow, between 2009 and the present, it was decided (presumably based on CERES measurements) that the Net Absorbed value (which is the extra energy absorbed that would result from increased GHG’s) would go DOWN from 0.9 w/square meter to 0.6w/square meter – an decrease of one third of the 2009 value. Knowledge on the energy exchange between Sun, Earth and space has recently been improved through new satellite missions such as the Clouds and the Earth’s Radiant Energy System (CERES, Wielicki et al. 1996) and the Solar Radiation and Climate Experiment (SORCE, Anderson and Cahalan 2005). These allow the determination of the top of atmosphere (TOA) radiative flux exchanges with unprecedented accuracy (Loeb et al. 2012). Much less is known, however, about the energy distribution within the climate system and at the Earth surface. Unlike the fluxes at the TOA, the surface fluxes cannot be directly measured by satellites. Instead, they have to be inferred from the measurable TOA radiances using empirical or physical models to account for atmospheric attenuation and emission, which introduces additional uncertainties. Uncertainties in the components of the surface radiation budget are thus generally larger and less well quantified than at the TOA. Debated are, for example, the partitioning of solar energy absorption between the atmosphere and surface, as well as the determination of the thermal energy exchanges at the surface/atmosphere interface (e.g., Raschke and Ohmura 2005; Wild 2008, 2012; Trenberth et al. 2009; Stephens et al. 2012b). The above highlights again just where there is "unsettled science". Notice particularly how Wild12 refers to the thermal energy exchanges at the surface/atmosphere interface. 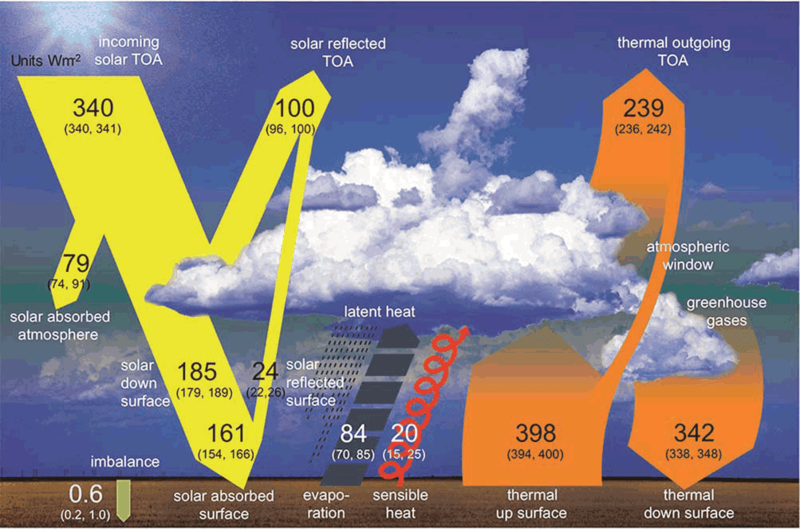 Also the reference to how much solar energy is absorbed in the atmosphere before it reaches the surface. Now go back to Anthony Watts mockery of the work that people have been able to do. He says of the latest changes to the energy budget that: "It seems to be a clear case of observations trumping Trenberth". There's the Serengeti Strategy in action. Anthony doesn't mention Kevin Trenberth's co-authors, John Fasullo or J. T. Kiehl. He doesn't give a hint of all the other people who've worked on this subject over the years, including the team that wrote the paper featured in the IPCC AR5 report. He doesn't mention the fact that even on the NASA poster itself there is another paper referenced, that of Loeb et al (2009), which has a whole other team. Nor does he mention the fact that there are papers relating to the energy budget being published all the time. Some look in depth at different components, other at the global picture all up. Here's a Google search just since 2013. And since Anthony is just another denier who doesn't even know where the observations come from or anything else about the data, who thinks that all the data for the Earth's energy budget comes from CERES, Anthony comes across as just another nutter when he talks about "observations trumping Trenberth". Wild, Martin, Doris Folini, Christoph Schär, Norman Loeb, Ellsworth G. Dutton, and Gert König-Langlo. "The global energy balance from a surface perspective." Climate Dynamics (2012): 1-28. This is not surprising given the tiny fraction of the “imbalance” relative to the total incoming energy. It would be remarkable if reliable measurements could be made to this level of accuracy given all the variables involved. Expect to see this number changed again and again. What is the uncertaity of these figures +/- ? Maybe net absorbed due to CO2 is zero? How accurate are those measurements? The result is 0.2% of the measurements. Yes, and you would have thought by now that they would have realised that recycled radiation (back radiation) cannot add heat to the surface from which it originated in the first place. Since most of net absorbed heat ends up warming the ocean (supposedly 93%), the Net Absorbed Energy is probably calculated from the amount of warming of the ocean. Increasing amount of ARGO data has allowed a more accurate calculation for Net Absorbed Energy. Net Absorbed Energy can not be calculated from the other values shown in these diagrams because the uncertainty in these values is far too high to say whether the net is positive (warming temperature) or negative (cooling temperature). DLR and latent heat have changed by 7 and 6 W/m2 – a changes that are 10-fold the net absorbed energy. SWR, reflected SWR, and escaping LWR are measured from space reasonably well (+/1 W/m2?). Downward LWR is being measure at some locations, but we don’t have reliable planet-wide coverage. The value shown probably comes from re-analyses made with climate models forced to fit observations, not direct observation. Latent heat can be easily calculated from precipitation (rain and snow). We have more data on precipitation from satellites which probably accounts for the 8% increase in latent heat. There is relatively little information about the amount of energy leaving the surface via thermals. In his 2009 paper, Trenberth chose this number so that there would be a net +0.9 W/m2 imbalance at the surface. He probably did the same thing here. ...The warmists always leave out TIME (nanoseconds) and day and night. As another commenter said they live on a flat earth with the sun always shining at 1/4 energy. They should be careful not to fall of the edge. So NASA believes in a NON rotating planet, seems funny given their experience in space, and insolation at a level that would not drive the water cycle. TOTAL NON-REALITY which means a model that assumes an impossible process, the GHE, and no process to actually start that impossible process or any feedback to control it at the levels claimed. See me after school Kevin. Maybe it’s just me but these graphics appear to made of ‘wishful thinking’, it’s nice to see their thinking sketched out in that format but the rest (the science part) leaves me with the impression that they are stabbing in the dark. Too many variables are treated as constants and also, the incoming energy is a fuzzy composite of IR, UV and visible spectrum, all of which vary and have different absorption and reflection properties. Too much averaging going on for me. I am still curious as to why the energy balance diagram does not show photosynthesis? Is the net absorbed heat go to global warming or to support plant growth? If 186W/m2 of sunlight reaches the surface, say for example if 20% of the surface is involved in photosynthesis (including stuff that grows in the water/ocean) with a conversion of 3-6%, that would work out to 1-2W/m2. Does the global warming model assume no plant growth? This is a figment of the imagination. The atmosphere does not heat the Earth’s surface, as the atmosphere is cooler than the Earth’s surface virtually everywhere and always. And, more importantly, the atmosphere does not heat itself. A Pyrgeometer is a very dangerous instrument in the hands of a “Climate Scientist.” Point it at the sky, read some Watts/M2, and conclude that the atmosphere heats the Earth’s surface because you are measuring a flux. Apparently Trenberth and his ilk are ignorant of the Second Law. How they got themselves these jobs, not knowing that, is a failure of our society. CO2 does absorb and thermalize IR in the 15-micron band. This is not strictly speaking Heat Transfer, but an electrical effect, same way a microwave oven works. The entire atmosphere absorbs and radiates heat, as does all matter above absolute Zero. Which is a suitable note on which to end the comments from the WUWT Illiterati Society. What's always been very interesting when observing the comments on 'the world's most viewed site on global warming...', is the way commenters each exist in their own little bubble with little interaction between them. Contrast this with the discussions that occur on the science-based blogs such as this one. It seems every person in climate denial has their own pet theory, their own blindingly obvious denial meme, their own little comforter; all of which insulates them from the science and even the views of their fellows. WUWT comment threads remind me of looking into a fisherman's bait box and seeing the mass of endlessly-writhing life in there, each little maggot travelling energetically in a different direction, each with its own purpose—driven by something beyond the understanding of the participants. No wonder everyone who has tried to insert some sense in there, in the end gives up and leaves them to their own devices. As word of the Geneva Convention has yet to reach the Climate Wars, an important variation has been embraced by true believers as well as denialists. In its Oreskes-Conway variation, the Strategy consists in waiting until the lions are long dead and pouncing on their carcases.